The Listed Property Owners’ Club is Britain’s only advice service dedicated to helping members get the most from their homes by providing detailed advice, information and support for just about every conceivable issue associated with ownership. Over the last 25 years we have saved our members thousands of pounds by ensuring they get the right help and advice for their property, and we understand how reassuring it is to know that there is a team of experts available at the end of the telephone. Call on our expertise on the responsibilities of owning a listed property including buying, surveyance, VAT, maintenance, energy efficiency, insurance and legal issues. Our in-house Conservation Advisors are here to help with all aspects of the planning process and to advise on unauthorised work by previous owners. Hundreds of nationwide specialist companies which members can approach with confidence, from architects to lime plastering, surveyors to window restorers. Our exclusive 150 page bi-monthly publication providing practical information, news, ideas and guidance on listed property ownership. 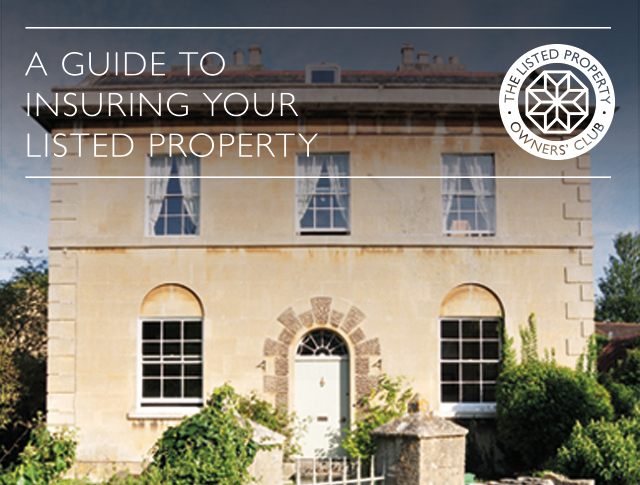 Full of information and briefings on all aspects of listed property ownership to keep your knowledge up to date. Includes a copy of your own home’s listing. Our political campaign for the reduction of VAT to 5% on repairs and approved alterations to listed buildings and the simplification of the planning process. Our unique lead house plaque are just £120 for LPOC members, non-member price £150. Our solid oak personalised plaques are £265 for members, non-member price £295. Free invites to the UK’s only show dedicated to listed property owners. Held every February at Olympia, London and every October at Assembly Rooms, Edinburgh. Click here for more information. 01795 844939. And don’t forget if you have insurance with us we will even provide you with discounted membership – only £30 per year! Speak to a member of the insurance team today to discuss your property’s requirements. Not got time to fill out a form? Send a quick enquiry. Fill in our online form to request a quote. It takes just 10 minutes. issues facing the owners of listed buildings. LPOC Insurance Services is a trading name of Aston Lark Limited under licence from The Listed Property Owners’ Club Ltd.
Aston Lark Limited is authorised and regulated by the Financial Conduct Authority.